Domesticated dogs do not live the kind of lives where their nails would be trimmed down naturally any more which means that every dog owner needs a best dog nail clipper in their possession. They most likely spend their days and nights on soft furnishing like dog beds, carpets or floors such as laminated or timber floors. Their outside activities may also be reduced to a couple of walks a day and even then may be on smoother tarmac surfaces, pavements or on grass. These starkly different lifestyles means dog nails can keep growing to the point where they can cause problems for themselves and potentially others. This is why we have created this list of the best dog nail clippers so that you can keep your dog’s nails in check on a regular basis easily and stress free for everyone involved. If you’re only interested in seeing what we think are the best choices then you can skip straight to them or you can continue to read our article on dog nail grooming tips in general. What to do if you do cut the quick? So here we are, the most important part of the whole page if you know you need a good pair of clippers and just want to see where you can buy one. We are going to list several choices to cater for anyone- this means we will cover the three different types (Guillotine – Scissors/Pliers and Grinder) and offer some recommendations on ease of ease, value for money and longevity. We willow course list the best clippers from the categories in an easy to read table and give our recommendation of the best overall nail clipper. We’ve covered many best of lists on the Jug Dog website so we’ve become quite good at this and our visitors seem to respect our opinions. If you agree or disagree with any of our recommendations please let us know in the comments. If you feel there’s a nail clipper we haven’t mentioned that really should be there then of course let us know. Anyway, without further ado; here is our list of recommended nail clippers for your dog. The Safari Professional Series is a fantastic scissor/plier style of trimmer and is our overall best choice dog nail clipper. Safari have designed the handles with human ergonomic design in mind and it’s very comfortable to hold and to hold still. This mean you are less likely to tremble and more likely to be able to hold the trimmer for longer without your hands getting tired or your grip getting tired – these are very important points when cutting your dogs nails. 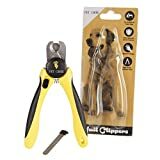 Next, are the extra sharp stainless steel pliers which cut easily and effortlessly which is a godsend for nervous dogs or those that squirm – you may only get a few seconds windows to be able to cut the nail down and that will be more than enough when you use these clippers. Great! The Safari clippers also contain a safety stop which prevents too much nail from being cut – this is super handy if your dog’s nails are particularly log and darker in colour where the quick is not visible. The Safari nail clippers have pretty much nothing but top notch reviews and there’s no surprises as they tick most of the boxes – the price point is very fair and will suit any budget and there’s two sizes available on Amazon to suit whatever size breed you have. If you’re looking for a clipper that just gets the done without any bells and whistles then this is the one for you – it may not be specialised and you still need to do it yourself but dog nail clippers don’t come better than this. 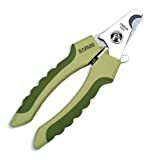 The Thunderpaws Dog Nail clipper are guillotine style clippers with extraordinary reviews (1,100+ reviews) and a sterling reputation online for being an easy to use and high performing gadget. But what’s so good about it? Well, for one the handles are ergonomically design to fit any grip whether you have small hands or big shovels and the spring in-between is sturdy enough to ensure a cut but not stiff enough that you need to be World’s Strongest Man to ply. The non slip and rubbered texture ensures good performance even if the job is taking forever. Great for first time cuts or nervous dogs. Next up is the veterinarian grade stainless steel cutters which ensures a clean, quick and smooth cut every time. Of course this is one of the most important factors of a dog nail clippers and the Thunderpaws cutter has this box ticked. The cutter also comes with a safety stop which helps stop over-cutting and getting too close to the quick. That’s another box ticked. Lastly, these bad boys come with a lifetime warranty and 90-day 100% money back guarantee meaning if they haven’t worked for you and not a fit for your style or dog then just send them back no harm done. Even if you do keep them the investment will be worthy one as you get the tools included to keep the blades sharp. What’s not to like about these eh? We feel these are one of the best scissor style dog nail clippers and well over 1,000 people can’t be wrong surely? If you don’t want the scissors or the grinders the these are the ones for you. DESIGNED FOR SAFETY FIRST - Nail trimming should be an easy experience, which is why each Thunderpaws Nail Clippers comes with a protective guard to protect your pets from "over-trimming" and safety lock for easy storage. Use the product as instructed to avoid injury to your pet. Only use for pet nail and keep out of the reach of children. The nail clipper is very sharp. Ensure it is properly locked and stored. SAVE BIG ON VET BILLS - Thunderpaws Nail Clippers is the complete solution for nail trimming that comes with an easy stored nail file. For the price of a single grooming session, you will never need to visit the groomer's to get your pet nails trimmed again! Wahl, famous for making products for the (human) barber trade have stuck their beak into the pet product world and come up with a worldy of a guillotine clipper. We’ve already explored the benefits of a guillotine cutter so what’s so good about the Wahl one? Well, for one this is made to a very good standard is an overall well made product – the spring the provides the power is made using quality materials to give an unbeatable cut which leaves the dog’s nail with a smooth, clean cut. The claw design provides enough space for small, medium and large dogs so this is a good purchase for any owner, this fact also makes it ideal for pet groomers as they can use it for all manner of dog. Also, the Wahl guillotine cutter is surprisingly lightweight for an all-stainless steel product. 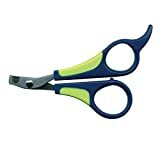 The handles are relatively comfortable but not on the same level as some of our scissor style cutters here. Lastly, this is a relatively cheap clipper with hundreds of reviews – clearly, this product offers excellent value for money and a ‘go to’ clipper. Lastly, we’d mention that during our time testing the product we did find that the clipper could be difficult to grip when sweaty or wet which is a warning for those who may be nervous cutting the dogs nails or use it near water, perhaps after a bath or shower. Overall though, we would say this is the best guillotine dog nail clipper you can get. The Petdiary nail grinder is an automatic nail grinder and completely different in terms of approach to the scissors and guillotine. The grinder from Petdiary has been designed with human and dogs alike as it has an ergonomic grip so that it’s comfortable to hold for a length of time – which is handy as you’ll need to for the grinder to get all of its work done. The grinding drum has also been designed with humans in mind and has several safety features which means that the grinder is probably more safe that both the scissors and pliers as it is unlikely to hit the quick quickly. The powerful steel wheel is adjustable to suit any dog. The diamond abrasive inside is high quality and even which gives an even finish to your dog’s nail. It’s made of super strong metal and grinds even the toughest of nails down effortlessly and cleanly. Regular maintenance is recommended to keep the wheel working at optimum capacity. The motor inside has a very long life which isn’t really essential but a nice to have – at the end of the day it could be charged easily between uses. However, if you run a dog grooming business then this feature may really stand out for you. Takes 2 hours to charge and lasts for 180 minutes which means you can get through a few pooches in the two hours. We’d recommend buying two of these if you do run a grooming business as one can be on charge while the other is in use. The noise coming from the grinder is also relatively quiet and Petdiary compare it with being slightly louder than a quiet office. Still, they recommend to expose your dog(s) to the noise of the device before any use of it starts and we’d also recommend the same. What separates this dog nail grinder from the others is that it’s an overall quality package with little to no faults and plenty of plus points. It’s quiet, powerful and ergonomically designed so that’s it’s a breeze to use. The price point is also very reasonable and we’d find it very difficult to not award this one the accolade of best dog nail grinder. 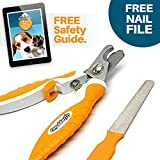 The Wagglies nail clippers is a very good package as it has the scissor style dog nail clipper, nail filer for regular maintenance and pruning and a handy safety guide. The free e-Book could put a lot of people at ease with a much more in depth guide than what you’ve read here and of course it’s permanently in your possesion. The scissor is made of premium stainless-steel as you’d expect and is made on an angle to make cutting easier and more comfortable. There is a safety catch on the scissor which means accidentally hitting the quick is an unlikelihood. The ergonomic handles make grasping and gripping a breeze, however the hard material can be tricky with excess sweat during an intense session. The nail fine is a nice extra but seems a bit of a gimmick as there’s no need to file a dog’s nails if they’ve been cut with the scissors, however if this sounds like an activity you’d like to do then go for it. The scissors, file and e-Book come with a lifetime guarantee which clearly shows Wagglies has confidence in the product. Overall, this is a great package deal for those who want that little bit extra in their purchase but not necessarily the best dog nail clipper. FREE E-BOOK SAFETY GUIDE! - Clip your dog's nails in confidence with our free safety guide, '6 Step Guide To Safely Trim Your Dog's Nails'! EASY GRIP ERGONOMIC HANDLE - Keep in control of the super sharp guillotine blades on our best dog nail cutter with safe, easy grips! There's no need to go to a vet anymore! BUILT-IN SAFETY GUARD FOR EXTRA SAFETY - With our built-in safety guard, there's no need to spend money at the vets when you can confidently clip your dog's nails at home! The brand may have a daft name but this is not a daft product! The Nobby nail clipper is another guillotine style clipper to compare with our favourite as an alternative. This product has somewhat of a modern design with an ergonomic grip and heavy use of plastic which I suppose makes it a bit more pleasing on the eye. 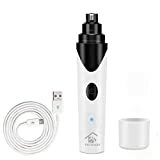 Comfortable for both humans and dogs this clippers is a budget option that gets the job done bu by no means does it have any bells and whistles or extras. Choose this if you and your dog are experienced with nail trimming sessions and it’s not anything new to you. If you’re new to dog nail clipping and unsure about all the quick business then we at JugDog would not recommend this one despite the low relative price it has. We’ve added it here to give our readers more options and to justify why the best is called the best. The SODEE nail grinder is a convenient alternative to scissors and guillotine style clippers. It’s very similar to our recommended Pediary version. However, it does have its own unique slant on the grinder scene to separate itself rom the crowd and to be a genuine contender for your business. The SODEE grinder has 3 ports (grinder heads) which are interchangeable to suit any small, medium and large dogs. The smallest port can even be used on smaller animals such as rabbits, hamsters and the like – however these animals tend to not have the same nail problems as dogs do but it’s still a nice little bonus especially for vets who may deal with a wide range of nailed animals. The SODEE grinder is charged with micro USB and takes around 3 hours for a full charge which is pretty standard. Once charged it should last you a good 7 hours of usage time (not idle time). Again, this is pretty standard and uses more or less the same battery as the Pediary. The engine driving the diamond grinder (extremely tough, doesn’t need replacing) is safe and affective and should make short work of even the toughest of nails. The grinder will also do it quietly and never go over 60db (a quiet office). It’s easy to clean and basically it’s a no hassle approach. We like the SODEE grinder a lot, it’s convenient, does the job well and won’t break the bank. The additional ports for smaller, medium and large dogs is a great bonus and should be at the top of the list for people with many animals, veterinarians and dog groomers. The Perfect Pet products nail clippers is designed for very small dogs and other small animals such as rabbits, cats and similar animals. They are not designed for bigger dogs as they lack the strength for a clean cut. These clippers are designed a little differently to the other dog nail cutters mentioned here and are more akin to regular scissors that you’d cut paper with. These clippers are extremely comfortable to hold and take very little space in the house when you out them away and if you have a small toy type dog then we’d recommend these over the larger ones which would be overkill. The clippers are sharp and accurate and get the job done with minimal fuss. Because they’re smaller than other clippers they are also much cheaper which is another huge plus point – the only point we’d want to make is to make sure to only use these on very small/toy dogs and that’s it. As a guide, the following breeds should be acceptable but as a responsible owner please use your best judgement/common sense if your dog is too big for them. Overall, these clippers tick all the right boxes and are the best nail clippers for if you do have a small dog but as mentioned previously, these would be totally ineffective on bigger dogs. The Dakpets clippers are a professional grade scissor style nail clippers with a superbly crafted blade and comfortable grips. These ones are one of the more premium versions available and they look pretty good too. Here at JugDog what we found was that these clippers are great are well built and really do out up a right challenge to our best choice clippers. We found the clippers to be quite big and cumbersome and although advertised for dogs of all sizes we wouldn’t want to try and use these on toy breeds and would recommending purchasing our recommended small dog nail cutters instead. The clippers include the quick safety guard, a mini nail filer so it’s a decent enough package and a very strong contender to win your business. In closing, there isn’t much that separates these ones from our top picks so the choice may well come down to which one you prefer the look of. 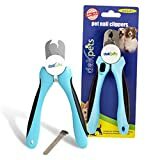 ✪ PROFESSIONAL GRADE PREMIUM BUILD Large dog nail clippers - trim your dogs nails with ease and take the stress out of pet grooming for both you and your pup. Powerful enough to trim nails with just one cut for fast, convenient at-home grooming. The Ancol Ergo guillotine clippers is an absolute cracker for budget conscious dog owners. Its quite a basic looking clipper but has everything you’d need from it – a comfortable grip, a sharp blade and a strong spring to cut those toenails down. It even looks decent and much more comfortable than the Wahl version. As with most guillotine clippers the biggest drawback is the the ring to place the nail is also the same size which can seem to big when you’re clipping smaller dogs. If the guillotine version is what you’re after and a cheap and cheerful one will do then this is the one for you. Can also be used for other similar animals such as cats and rodents. The clippers have an ergonomic, non-slip grip handle. The nail can be placed into the guillotine and simply snipped. Guillotine Clipper is a quick and effective way to trim long claws. Above, we’ve covered the fact that you should be taking care of your dog’s toenails because they can’t do it naturally because of domestication. Here, we explain why it’s important to keep a dog’s nail in check. Just like our nails, dog nails constantly grow. They grow so that they don’t constantly accumulate damage and so that a dog always has workable nails. Because dog nails do not contain any living tissue – they constantly grow as they cannot ‘heal’ or repair themselves. This is true of any mammals with claws. Dogs are born with several important tools such as teeth, a tail, great eyesight and claws to help them grip and rip prey. If their nails are not usable then they will surely suffer and this is why dog nails constantly grow throughout their lifetime. When long nails touch the ground they can create uneven pressure to your dog’s paws, tendons and joints as it’s the paw that should be hitting the ground and you shouldn’t hear nail noises when they are walking around. This over a long period of time can cause pain and discomfort for your dog and make their paw flattened and splayed. In serious cases of canine neglect, overgrown nails will eventually curl round and could puncture the paw which can lead to some serious health issues and an extremely painful and unpleasant situation for your dog that pain relief for dogs can’t help. Generally, if you’ve landed on this page then you clearly care for your dog – if their nails have got to this stage then please do something about it asap. The longer the nails, the more likely it is they can get split or turn which can be extremely painful and would require a veterinarian’s interception. Torn and split nails have gone way past a scenario where dog clippers can fix. Long nails which have led to a painful paw area for your dog can make your dog not co operate when it’s finally time to use the dog nail clippers. This creates a vicious cycle where your dog simply doesn’t want you to go anywhere near the paws, especially the nails, even though it’s for their benefit. It goes without saying that prevention is better than a cure when it comes to nails and foot hygiene in general and by introducing the clippers at an early age you can avoid all of the problems listed above. There’s no point in buying one of our best dog nail clippers if you don’t know how to use them and they are also one of those product where we recommend not diving in without learning how to use them. We’ve prepared a short guide here on how to trim dog’s nails with clippers here but if you already know and just want to see which dog nail trimmers we recommend then by all mean skip to the reviews. Before even thinking about using dog clippers on their nails you need to get the dog comfortable with you holding their paws and teach them to be still and patient. As with any aspect of dog training you need to be consistent and regular with this endeavour and to give them a treat if they show the desired behaviour. Hold the dog’s paws and see how they behave, if they don’t try and take it away and happy with you handling it then praise them and perhaps give them a treat. If your dog seem to not like you holding their paws then first check to make sure there’s no health issue and second treat them while the paw is in your hand. With luck, your dog will start to associate you holding the paw with treats and be content with you handling them. This will be essential for a stress free dog clipping session in the future believe us. Making sure to choose the correct nail clipper and strategy is key. The biggest concern and factor to consider is how big the dog is – bigger dogs have longer and tougher nails and need stronger nail clippers to cut through the toenails. However, most of our recommendations here should suit any dog but we have made sure to highlight our most recommended clippers specifically for small or large dogs if you need something a bit specific. Unless you haven’t done any research into this already – you can’t simply grab a dog’s paw and then cut the nail down. Dog’s nails aren’t quite like a humans – they need to be cut correctly, gradually and to avoid the ‘quick’. If you’re not familiar with this word then hopefully you haven’t already started. The dog nail quick is the exact reason why many become nervous with cutting dog’s nails with clippers in the first place. The quick is a vessel of blood which enters the nail, the quick also contains some nerves which means nipping them can cause pain and discomfort. If your dog has light coloured nails you can usually see the quick, but if your dog has dark nails (Jeff, would you believe has half and half) then that’s when it can become tricky. It’s important to never cut too far in because you will surely catch the quick, this is why we recommend cutting a little bit off the nail on a regular basis and never big whole chunks. Now that you know about the quick it’s time to figure out the angle to cut the nail with the clippers. The key at this stage is to get the angle spot on and just take a little bit off as a starter for ten. Hold on to your dog’s paw firmly but gently, praising them for every successful nail cut. We’ve provided an image here giving a bit of an indication of where to aim for. Hopefully these images will be able to help you out, the key takeaways are to only cut a little bit of the nail off each time and to do it regularly so that the quick recedes. Trimming at a 45 degree angle is also recommended for the best chance to avoid the quick if your aim is off. Even if you’re a seasoned pro and your dog is as cool as a cucumber having his or her nails cut you should still only cut a small amount off and instead be trimming them on a regular basis. The image above should be enough of a guide on how much to cut. Don’t panic! If your dog isn’t alarmed then don’t show them that you are. If your dog is alarmed though then don’t make it worse by joining in. Remain calm, gather your thoughts and soothe your ailing pooch. Use styptic powder! Styptic powder can stop the bleeding almost instantly and provide some pain relief for your pooches poor nail. Don’t leave it too long before trying again! Your dog and even you may have lost confidence in the whole dog clipping endeavour but you shouldn’t leave it for too long before trying again. Restore confidence by bringing dog treats back into the mix and celebrate every successful cut like it was our first. Before long the whole bloody mess will have been forgotten about by you and your mutt. There are three main types of dog nail clippers that and you may or may not be familiar with all of them. They are the ‘guillotine’, ‘scissors’ and the ‘rotary sander’. The first two are pretty similar but the sander is completely different with perhaps a different approach to it as well. Here we’ll discuss the differences between them and the pros and cons to help you find which dog nail clippers are the best option for you, your dog and your budget. Guillotine nail clippers have a round area to put the nail in and then a blade cuts from one side for a clean cut. Guillotine clippers are handy as they will always cut in a straight line making aiming easy. However, as that is also it’s downfall as guillotine dog nail clippers can become annoying when trying to cut the nail at an angle. Most guillotine clippers can have replaceable blades giving them a lot of mileage. Guillotine clippers are good for most nails but not versatile enough for larger dogs or curved nails such as dew claws as they lack the power required. The most common type of dog nail clippers are the scissor/plier type of clipper. The sharp stainless steel cutting blades come together to snip part of the nail. The design allows for precision while the construction and grip allow for power for a quick and easy snip even for larger dogs. However, the clippers are more of a challenge to use on smaller nails as it lacks the accuracy of the guillotine type when it comes to avoiding the quick. Some do come with adjustable cut guard but not all. Last, but not least are the dog nail grinders or sanders depending on who you ask. These are completely different as they do not cut the nail at all but just sand it down to the desired length. More costly, can be a bit uncomfortable for your dog because of the noise but can be a god send for people who really are nervous about cutting the quick. Not our first choice to recommend but we still would recommend it under certain circumstances.